With the Energy Policy Act of 2005, resulting in U.S. Daylight Savings Time being extended 4 weeks, has anyone looked at how to make those changes in WorldTime? For instance, Daylight Savings Time will now commence on 11 March 2007 (three weeks early) and end one week later in the year. I am still using the exceptionally stable and venerable 5.5.2.748 version--too many applications to configure the 6.x versions. Im using Version 6.0.0.941. I used the DST Manager and used pull down menus to change the dates for the U.S.. But Main Clock is updated with my system but the other N.A. States were not corrected and updated? Why? O.K. I figured out updating the N.A. clocks. 1). select the clock then open the clock manager. 2). Select apply to update the clock. 3). The North American clocks are updated.. But you must update the DST Manager first! Now my Clocks are all updated! 1. open each location in LocMan and reselect the DST rule. 3. open each clock and reselect the location. I am not sure all these steps are needed but it is a routine that works. If you miss bits of it you can end up with clocks that remember the old rules. OK, I edited the files but couldn´t get this to work. Any chance someone could post the updated files? For version 5, if you want clocks that you add to your display to be correct also you must make the changes to wtzones.wtd in addition to wtdst.wtd and wtclocks.wtd. Ok, you don´t have to delete your clocks and add them back. After you´ve manually updated the wtdst.wtd and wtclocks.wtd files, just launch WorldTime and then right-click on one of your clocks, click This Clock, Configure. At this point, all you have to do is click the Apply button and the DST change will take effect. Does Dstman really not work in version 6? Like lenr I was able to edit the North American rule and save it. When I close and open Dstman I see the changes. I did an experiment which seems to prove that Dstman does work. today and ended at 3:00 pm today. city so I can be sure of what the time should be. the program and restarted it at this time. I think I did. The dst rule was not applied at 2:45 as expected. standard time at 3:00 pm as expected. to a given location clock. - Bleah... sorry for the multiple posts (er... triplicates. Somehow I managed to screw things up and posted multiple copies. Sorry about that. - replacing this: "North America/1.1.4.60.02:00:00/L.1.10.0.02:00:00/"
- with this: "North America/2.1.3.60.02:00:00/1.1.11.0.02:00:00/"
(4) Save the file, close it, exit the editor and restart World Time. 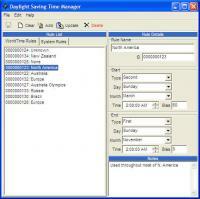 You´ll find all the North American cities now have their DSTs set to these new settings. In other words, the actions suggested by sbaker need to be applied to BOTH the wtdst.wtd and wtclocks.wtd files. I suspect you have to then open locman and reselect the dst rule for each location then close and re-open wt for the change to be effective. Version 6 DST update was fairly easy to complete manually for me. Right click on an United States time display and from the dialog box select TOOLS and then on the subsequent dialog box select DST MANAGER. edit the April event to SECOND Sunday in March and October event to FIRST Sunday in November. Select UPDATE and the SAVE Icon. As a long time user I would like to encourage you to fix the bugs in version 6. I would think it would be much quicker to fix the major bugs than to rewrite portions especially the DST manager. I would much prefer that I be able to add my own locations locally rather than having to go to a web site. What happens if pawprint decides not to support Worldtime including the new Wiki version on their site or goes out of business? Already as noted below some of the download links no longer work. The Worldtime@pawprint.net mailbox as listed in the readme file no longer exists. I still think this is a great program and do appreciate all the work you have put into it. The primary download link for v 5.5 does not work. The bad links go to GoDaddy.com or are not found at all. The bill amends the Uniform Time Act of 1966 by changing the start and end dates of daylight saving time starting in 2007. Clocks will be set ahead one hour on the second Sunday of March instead of the current first Sunday of April. Clocks will be set back one hour on the first Sunday in November, rather than the last Sunday of October. This will make electronic clocks that had pre-programmed dates for adjusting to daylight saving time obsolete and will require updates to computer operating systems. The date for the end of daylight saving time has the effect of increasing evening light on Halloween (October 31). First - for the local clocks - it´s going to be up to Windows to make the change - and as far as I know there is already a Microsoft update out to address that. This is pretty important because WT get´s the UTC time from the Windows Clock - so it needs to know the current offset or ALL clocks will be off. For any US location clocks the WT DST rules will need to be updated. in version 5.5 these are stored in the file wtdst.wtd in the data folder. North America/1.1.4.60.02:00:00/L.1.10.0.02:00:00/Used throughout the USA, Canada, and most of North America. North America/2.1.3.60.02:00:00/1.1.11.0.02:00:00/Used throughout the USA, Canada, and most of North America. I´m desperately busy with work/Coast Guard Aux stuff at the moment - but I am working on this and I´m going to do my best to have something in place before the DST change.